In Linux you would have to type in the command on a terminal to open the wnds and update the car's engine every other Tuesday. As far as the engine, no wonder it purrs so well, it gets an overhaul every Tuesday. And that's how they keep dropping things like bolts and screws down the carburetor so they get lodged in the pistons and hold the valves open. So we have this cool knocking sound and flame blowing out the exhaust pipes. Do they still make cars with carburetors? Of course the car would have windows but they`d be bringing out a new version every five minutes. 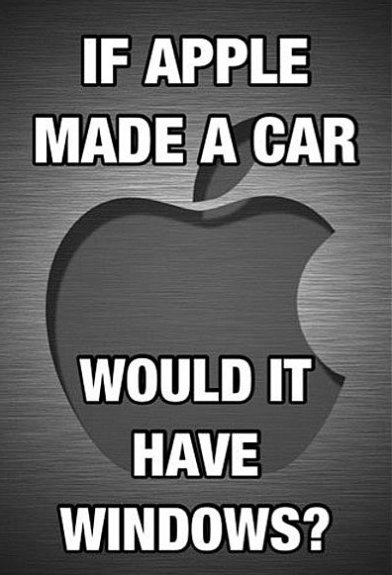 Another one is: Does anybody still make real cars? I only know of a couple! And they are grossly overpriced for what they are.